Use your imagination and creativity this spring break to bring out the artist in you! Want to help prepare your child for what a camp experience is like? Take a look at our camp social narrative! No need to bring any art supplies! They’re included in the camp tuition. Abracadabra! 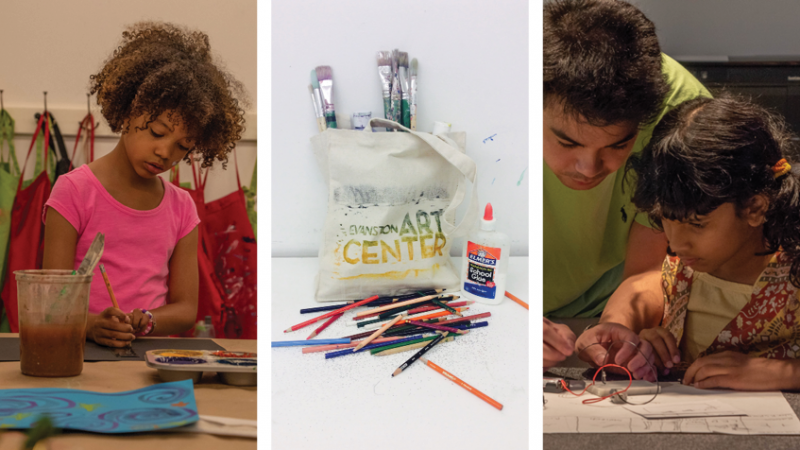 During Spring Break Camp our younger campers will explore Surrealism and other magical art, creating works of art inspired by magic or that have a magical properties (such as sun prints that magically will appear, or glow-in-the-dark paint). Afternoon ceramics campers will create mythical creatures and more. On Friday, March 29: come to camp dressed up related to the magical theme! SAVE! Become a Member Today! Students with Disabilities are Welcome! EAC welcomes all students with disabilities to join our classes! EAC is wheelchair-accessible with power-assist doors, an accessible restroom, and an elevator. If your child requires any accommodation to fully participate in the camp, please contact EAC’s Director of Education with as much advance notice as possible. To ensure the best experience possible, we appreciate your sharing as much information about your child as you feel comfortable. For all-day camps, students bring their own nut-free lunch. If you’d like to register your child for a morning and an afternoon session, a 30-minute supervised lunch break is included at no extra charge. If you cannot pick up your child until 4:30 p.m., they can stay with a Teaching Assistant and continue to work on their projects started earlier in the day. $15 per day. Advance notice is needed. Contact the Director of Education to arrange. Our Director of Education is happy to chat with you about what camps she recommends for your child, and to answer any questions you may have. Please contact Christena Gunther cgunther@evanstonartcenter.org(link sends e-mail) or 847-475-5300 ext. 108. The first day of camp all guardians must complete an emergency contact form that includes multiple phone numbers and any medical or emergency information. We suggest you fill out this form prior to your arrival to expedite first day check-in process. Read more about EAC's policies refunds, cancellations and financial aid.